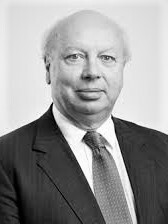 After a career in international banking in London and Singapore, where he held a number of senior positions with Citibank, Oceanic Finance Corporation, American Express and Henry Ansbacher, Alasdair established Abbot Group in 1990 to provide advisory services and invest in shipping and oil service businesses. The company listed on the London Stock exchange in 1995 and delisted in 2008 following acquisition by a private equity group. Abbot Group Ltd has grown into one of the leading international oil and gas drilling and engineering businesses, with annual turnover of ~$1.3bn, ~6,500 employees and operations in 21 different countries. In 2011 Alasdair relinquished his interest in Abbot Group and in 2012 became Chairman of Hardy Oil & Gas Plc. He is also a shareholder and director of Motor Fuels Group. Marine Capital, the London-based investment company, could be entering new shipping segments with a series of massive investment opportunities which are being explored right now. CEO Tony Foster tells ShippingWatch that a series of ventures are being scrutinized and have the potential to be closed in the relative near future. Firstly, a new investment venture backed almost exclusively by pension funds is expected to reach at least USD 350 million soon. Marine Capital has spent quite some time already with the group of investors, but the intention is to have the first close for the venture around the end of Q1 2019. Secondly, opportunities in the quickly expanding LNG-market are also being explored, meaning that the company is looking to buy tankers. And thirdly, a major FLNG project, involving a unit with close to USD 2 billion price tag, is also in the pipeline. 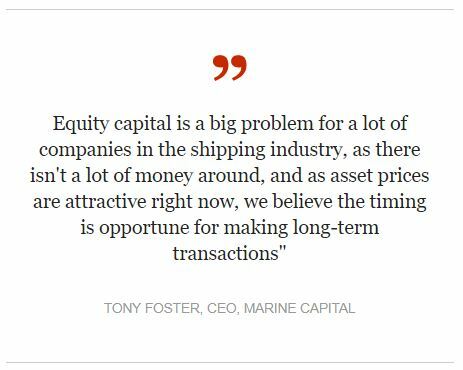 “Equity capital is a big problem for a lot of companies in the shipping industry, as there isn’t a lot of money around, and as asset prices are attractive right now, we believe the timing is opportune for making long-term transactions,” Tony Foster explains. He specifies that Marine Capital is bidding to buy LNG ships “of standard size” with full employment and which would be UK-flagged. Shipowner and operator From the perspective of the maritime world, Marine Capital is unique compared to other private funds in that it serves as both fund manager and asset manager, i.e. it has full shipowning and operating capability. CEO Tony Foster worked 25 years in the industry before he founded the investment company in 2003. Before that he was among the first directors of Hong Kong-based Pacific Basin, and was shipowner and operator, as well as working with Wallem ship management and as a broker. He also commented that longer-term investment opportunities might well lie in other sectors, where large amounts of capital were required and counterparties were of high quality. “MCL’s clients tend to be large institutions who would like to deploy ‘meaningful’ amounts of capital if the opportunity is attractive enough. We can also be flexible as to where we sit in the capital structure,”’ he said. Reproduced with permission from Tomas Kristiansen’s article in ShippingWatch 18/12/2018. The increasing emphasis on environmental, social, and governance (ESG) factors in institutional investment and business decisions will be the major driver of change in the shipping industry. This is the view of Tony Foster, chief executive officer (CEO) and chief investment officer of shipowner and operator Marine Capital. He spoke with Fairplay at his London offices last week. Foster speaks out regularly on the need for shipping to do more to embrace its ESG responsibilities and was one of the 34 maritime CEOs who recently signed the widely publicised call for action in support of decarbonisation of the industry at the Global Maritime Forum in Hong Kong. Foster’s cognizance of ESG issues is driven by the fact that he spends much of his time interacting with pension fund investors. Many of these long-term institutions are adopting investment strategies that seek to address issues like climate change, which, says Foster, “obliges us to rethink some of the deals we might be doing”. He cites as an example, Canadian pension fund La Caisse de Dépôt et Placement du Québec (CDPQ), which manages more than USD300 billion in assets worldwide. CDPQ has been integrating ESG factors into its investment processes for many years but recently has become more explicit, declaring publically that “the climate will factor into each investment decision”. The firm’s goal is now to “contribute constructively to the fundamental transition [to the low-carbon future] the world is facing”. According to the most recent figures from the Global Sustainable Investment Alliance (GSIA), some USD23 trillion of professionally managed assets now use ESG and other responsible investment strategies. This is an increase of 25% from 2014 and represents about 26% of all assets managed globally. In Europe, more than 50% of assets are now managed in this way, although many of these are still exposed to climate change risk. Foster has been actively talking to pension funds for seven or eight years. “We made a conscious decision to target pension fund investors because they have the necessary long-term perspective and can provide the permanent capital that shipping needs.” He sees funding from private equity investors as being too short-term and often targeting unrealistically high returns. For the past two years, he has been building interest in the idea of a new marine asset investment vehicle among large institutional investors. This is now expected to launch in early 2019 with about USD500 million of fresh capital and a final target of having USD1 billion under management. The new fund will aim for “long-term annual net returns in excess of 7%” and have discretion to invest in any marine assets while taking ESG factors into account. Foster’s main strategy is to match the long-term investment horizons and liabilities of his investors with long-term time charters of up to 10 years, thus locking in returns and avoiding the cyclicality of the market. One of the challenges that Marine Capital has faced in engaging with potential investors is that, in many cases, they are still formulating their ESG frameworks, trying to define how to apply ESG criteria and how to measure outcomes. This is particularly true in the case of alternative assets and especially so in relation to shipping, which, to many, is still a new and unfamiliar asset class. As a result, investors often have distinct ESG requirements. Some may be wary of investing in a shipping venture involved in transporting coal. Others may be less concerned about the type of cargo carried, but require the ship to be powered by liquefied natural gas or another alternative fuel, considered by their criteria, to be cleaner than heavy fuel oil. For Marine Capital as the investment manager, this means having to put ESG questions into context and being able to demonstrate consistent improvement in ESG outcomes. Despite the differences in approach among investors, Foster is in little doubt about the direction of travel. He sees pressure continuing to build on the industry to embrace ESG, specifically in relation to climate change, not just from pension funds, but from governments, banks, and other financial investors, as well as from individual shareholders and consumers, particularly younger ones. In the United Kingdom, the government recently published new rules requiring pension funds to explain their approach to ESG factors, while non-governmental organisations (NGOs) such as ShareAction are putting pressure on banks at annual general meetings to justify their lending practices, including to the shipping industry. A recent paper from Oxford University’s Oxford Martin School, Fossil fuel divestment and engagement on climate change, sets out the “significant financial and ethical challenges” faced by investors in companies in the fossil fuel industry and in other industries, such as shipping, that are making long-term capital investments in “polluting assets”. The paper provides advice on how investors can ensure that the financial risks to their portfolios from decarbonisation of the global economy are being properly assessed, particularly the risks from exposure to “stranded assets” – assets that will have no value in a zero-carbon world. Speaking to Fairplay at the weekend, Bill Hemmings, director of aviation and shipping at Brussels-based NGO Transport & Environment (T&E), suggested that climate risk should be factored into every shipping company’s annual report. He welcomed the call for action by CEOs at the Global Maritime Forum (GMF), seeing it as “a sign of growing awareness” in the industry of the potential impact of climate change. “The fact that GMF is talking about decarbonisation is fantastic”, a big change from just three years ago when the issue was “barely on the radar”. Hemmings hopes this increased awareness will translate into shipowners thinking much more carefully about the question, “what sort of ship should I order in the future?” And he expects bankers and investors to become much more discriminating about the kinds of shipping projects in which they are willing to lend or invest. One problem for the industry, as Foster has found in talking to his investors, is to agree on the metrics. “If we can’t agree on what a green ship is, how can we persuade others to invest?” asks Hemmings. As a starting point, Hemmings advocates creating an efficiency measure for existing ships to complement the Energy Efficiency Design Index (EEDI) for newbuildings. The second step will be to achieve some consensus on which low- or zero-carbon fuels can be considered compatible with achieving the goal of decarbonising the industry. A new, relatively succinct report from T&E published in the past few days, Roadmap to decarbonising European shipping, provides a fresh perspective on this issue and also assesses the likely impact of decarbonisation on renewable energy demand in the European Union. The report comes out strongly in favour of batteries, hydrogen, and ammonia as the future means of propulsion for ships. These produce no greenhouse-gas emissions at the vessel level and the amount of renewable energy required to produce them is far smaller than for alternatives such as synthetic hydrocarbons using CO₂ captured from the air, including electro-methane and electro-diesel. The report is particularly scathing about the idea of using biofuels in shipping due to “unique enforcement and sustainability challenges, which … would appear to be insurmountable from a regulatory point of view”. T&E’s concern is that there would inevitably be a big increase in use and production of non-sustainable crop-based biofuels such as palm oil and ethanol. These produce higher lifecycle CO₂ emissions than the fossil fuels they would replace and would also cause further deforestation in Brazil, Indonesia, Malaysia, and elsewhere. Investors will increasingly demand clarity on these and other issues as efforts to combat climate change intensify and as the realisation grows that polluting assets will likely be rendered unusable within three decades if the goals of the Paris Agreement are to be met. Not only will this drive change at the corporate level but it should also help to put some much-needed wind in the sails of the International Maritime Organization as it strives to introduce the regulatory changes needed to develop its GHG strategy for the shipping industry over the next few years. Reproduced with permission from Paul Smith’s article in IHS Fairplay 19/11/2018. There is no doubt that the world needs shipbuilding capacity. However, it is also clear that it is challenging business. In this month’s Spotlight we take a look at the state of the world’s largest shipbuilding countries—China, Japan and South Korea—and the outlook for the future of shipbuilding. In this month’s Spotlight we take a closer look at products tankers, assessing the impact that the complex demand drivers could have on the sector. These include a shift in refinery capacity eastwards, uneven growth in global demand and, of course, the upcoming 2020 sulphur cap. Could product tankers be about to emerge from the doldrums? VLCCs: More Than Just Fashionable Investments? This month’s Spotlight takes a quick look across the major marine markets and how they have performed in recent months. We also consider how some of the highest profile issues affecting marine markets, such as actual or potential trade wars, may affect individual sectors. Liner Companies: Can They Make Money? This month, our focus is on container shipping, and specifically on the liner companies themselves. In recent years competition has kept the cost of ocean freight low and the margins of liner companies tight. While there have been some positive steps taken to lower operating costs, rising fuel prices have proved a particular challenge in the first half of 2018, narrowing margins and leaving the liner companies scrambling to impose emergency fuel surcharges. Although these are testing times, is the longer-term outlook brighter? How Will The World's Shipping Fleets Be Funded? We are often quizzed about the nature of volatility in the marine markets—how it arises, whether the public perception of wild swings is a true reflection of all market activity, and whether it can be managed from an investment perspective. In this report we look at the conditions specific to marine assets and markets, and the tools available to manage volatility at the individual asset/transaction level, as well as through a portfolio approach. The International Maritime Organisation meets in London this week. While there is broader public desire to accelerate improvements in such areas as emissions control, and changes are afoot, the matter is complex. The 2020 deadline for the ‘Sulphur Cap’ is fast approaching. In this month’s edition we take a moment to shine the spotlight on the 2020 change and its repercussions for stakeholders. Gas & Shipping; A Future Intertwined? Old King Coal: Is The Crown Permanently Tarnished? The expression ‘King Coal’ draws most of its heritage from an eponymous novel of 100 years ago, in which an American author wrote on the tough life for coal miners in the US, and their daily struggles. Now it seems to be coal itself which is engaged in a life struggle (despite, ironically, the intervention of the current US President). This polluting but cheap and plentiful energy source, an essential (and huge) component of the global energy mix and a very important component of the dry cargo shipping market, is fighting, for now at least, what appears to be a losing battle against cleaner energy sources, which are also plentiful and (potentially) cheap. As ever though, the market pressures felt by the ships that carry coal are not parallel to the vagaries of the commodity itself, as we demonstrate. Dry Cargo Shipping – The Sunlit Uplands? Dry cargo shipping sectors have, on the whole, performed significantly better in 2017 than they did in 2016. Some commentators are undoubtedly bullish now, and the $64,000 question is, of course, whether the dry cargo markets are set fair for an upward trajectory, or if there is reason to remain cautious. We are in the positive camp and this report outlines our views and provides a supply and demand outlook for the sector. LPG seems to attract fewer headlines than LNG in the energy world. However, when considered as a proportion of total production, seaborne trade is of greater significance for the LPG market than for LNG (30% of LPG produced is shipped, vs just 10% of natural gas) and has grown much faster recently—the average annual growth rate in LPG trade has been double that of LNG over the last five years (8.2% vs 4.3%). US shale exports and growing Asian petrochemical demand have been instrumental in reshaping global LPG trade flows, but this has not been enough to counteract excessive fleet growth and over the last two years the sector has faltered. In this report we look at the current state and outlook of the LPG sector. LNG-related Infrastructure – Brave New World? Following on from our LNG update in May 2017, we take a closer look at LNG-related infrastructure, focusing on the opportunities presented by FSRUs (floating storage & regasification units) in accessing new LNG markets. These smaller, emerging markets have accounted for a large proportion of LNG demand growth in recent years and FSRUs have played a pivotal role for many—providing quicker and cheaper access to LNG imports than via the construction of onshore infrastructure. To date, the FSRUs employed have been based on standard LNG carrier sizes, but a significant opportunity exists for smaller-scale FSRUs to provide similar access to nations with lower volume requirements, at extremely attractive per unit costs and under more flexible contract terms. As the FSRU solution moves away from “one size fit all”, the future looks bright for new markets looking to access LNG via floating infrastructure. In this month’s market report we’re looking at two issues—both with potentially important commercial implications for shipowners. The first looks at investment management/decision-making and how secure cash flows can be achieved in shipping investments. The second section presents our view on the upcoming IMO ‘Sulphur Cap’ which will have an impact on all ships trading from the 1st January 2020. Following on from our recent in-depth reports on individual shipping sectors, this month we turn our attention to German banks and the potential implications for shipping finance, as well as the process of ship demolition—a fundamental mechanism of the market which is often misconstrued. The Container Shipping Business – No Longer in Intensive Care? In this month’s market report we take a look at the containership sector. While the recent results from leading liner company, A.P. Moller-Maersk, are encouraging, not all in the sector face a healthy outlook. As the liner companies in the market undergo increasing consolidation, tonnage providers who charter their ships to liner companies (and whose margins have no clear correlation to those of the liner companies) face greater challenges in running a profitable fleet. The recent rise in second-hand prices, the upcoming changes to lease accounting standards, and future emissions regulations all play a part in deciding if and how to invest in containerships.